A group of singers with a pianist visit our Day Centres and Residential Homes including the Cheshire Home. We were set up in July 2013 and have fulfilled 16 engagements We spend an hour singing, songs with the people gathered for our visit. Singing is recognised to be of great health benefit to everyone, but in particular to those who are older or disabled. We see this a form of therapy and have been told on many occasions that "there are many groups who perform but you are the only group to come in and sing with our residents" In one residential home the daughter of a resident said "This was the best afternoon my mother has ever had in the 18 months she has been here". 'Go Perform' was launched in November 2014 and compliments its partner 'Go Sing'. It consists of a group of people who have extensive experience in the performing arts. 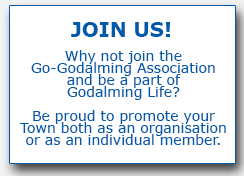 Many perform with local groups, such as Godalming Choral Society, Godalming Operatic Society, Godalming Theatre Group, Guilford Opera and other Surrey based groups. We can provide entertainments for groups and organisations, which would typically include songs from light opera and musicals; other topical/seasonal songs together with readings, poems and sketches. We hope to provide entertainments to the local old peoples' homes, especially at Christmas time, as well as other times in the year.